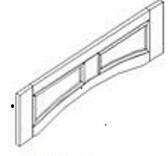 Gramercy White Outside Corner Molding 3/4"H x 1/4"T x 72"L.
Gramercy White Scribe Molding 3/4"W x 1/4"H x 96"L.
Gramercy White Dishwasher End Panel. 24" depth, 34 1/2" height, 1/2" thick with 3" trim plate. 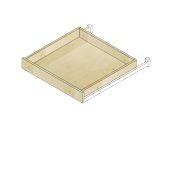 Includes 3" trimable filler, and cutout for the toe kick area. Birch, all wood construction, metal snap & lock assembly system. Ready to assemble. Gramercy White Finished Back Panel 34-1/2"W x 1/4"T x 96"L. Finished on one side. Grain runs the 96" length. 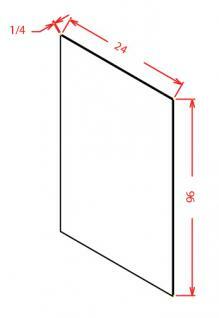 Gramercy White Refrigerator End Panel 24"D x 96"L with 3" filler attached. Gramercy White Refrigerator End Panel 30"D x 96"L with 3" filler attached. End Panel Decorative End Panel Base Door 23 3/4"W x 29 5/16"H. Gramercy White, Full overlay door, Wood: Birch, Finish: Gramercy White, raised center panel. Meant to be applied flush with the face frame of the cabinet. End Panel Decorative Wall Door 11-1/2W x 29-5/16"H Gramercy White Full overlay door, Wood: Birch, Finish: Gramercy White, raised center panel. End Panel Decorative Wall Door 11-1/2"W x 35- 5/16"H. Gramercy White. Wood: Birch, raised center panel with full overlay door. End Panel Decorative Wall Door 11-1/2"W x 41-5/16"H. Gramercy White. Wood: Birch, raised center panel with full overlay door. Gramercy White Decorative Spindle Post 3"W x 3"D x 34 1/2"H.
Gramercy White Large Decorative Valance 5"H x 36"L. Available in 42"L and 48"L. Select the length in the drop down box in the shopping cart. Gramercy White Valance scalloped 4 1/2"H x 48"L. 5/8"T.
Mullion Glass Door fits 15"W x 30"H Wall Cabinet, 1 door, square mullions, clear glass. Purchase cabinet and replace existing doors with the Mullion Doors. Gramercy White full overlay door, Birch, White finish, raised center panel, Matching finished interior and exterior. 6 way concealed soft close hinge. 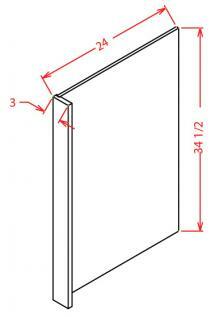 Mullion Glass Door fits 15"W x 36"H Wall Cabinet, 1 door, square mullions, clear glass. Purchase cabinet and replace existing doors with the Mullion Doors. Gramercy White full overlay door, Birch, White finish, raised center panel, Matching finished interior and exterior. 6 way concealed soft close hinge. 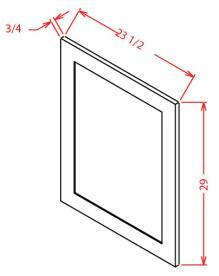 Mullion Glass Door fits 15"W x 42"H Wall Cabinet, 1 door, square mullions, clear glass. Purchase cabinet and replace existing doors with the Mullion Doors. Gramercy White full overlay door, Birch, White finish, raised center panel, Matching finished interior and exterior. 6 way concealed soft close hinge. 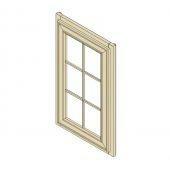 Mullion Glass Door fits 18"W x 30"H Wall Cabinet,1 door, square mullions, clear glass. Purchase cabinet and replace existing doors with the Mullion Doors. Gramercy White full overlay door, Birch, White finish, raised center panel, Matching finished interior and exterior. 6 way concealed soft close hinge. Mullion Glass Door fits 18"W x 36"H Wall Cabinet, 1 door, square mullions, clear glass. Purchase cabinet and replace existing doors with the Mullion Doors. Gramercy White full overlay door, Birch, White finish, raised center panel, Matching finished interior and exterior. 6 way concealed soft close hinge. 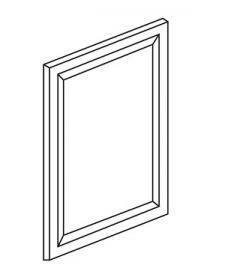 Mullion Glass Door fits 18"W x 42"H Wall Cabinet, 1 door, square mullions, clear glass. Purchase cabinet and replace existing doors with the Mullion Doors. Gramercy White full overlay door, Birch, White finish, raised center panel, Matching finished interior and exterior. 6 way concealed soft close hinge. Mullion Glass Door fits 30"W x 30"H Wall Cabinet, 2 doors, square mullions, clear glass. Purchase cabinet and replace existing doors with the Mullion Doors. Gramercy White full overlay door, Birch, White finish, raised center panel, Matching finished interior and exterior. 6 way concealed soft close hinge. Mullion Glass Door fits 30"W x 36"H Wall Cabinet, 2 doors, square mullions, clear glass. Purchase cabinet and replace existing doors with the Mullion Doors. Gramercy White full overlay door, Birch, White finish, raised center panel, Matching finished interior and exterior. 6 way concealed soft close hinge. Mullion Glass Door fits 30"W x 42"H Wall Cabinet, 2 doors, square mullions, clear glass. Purchase cabinet and replace existing doors with the Mullion Doors. Gramercy White full overlay door, Birch, White finish, raised center panel, Matching finished interior and exterior. 6 way concealed soft close hinge. Mullion Glass Door fits 36"W x 30"H Wall Cabinet, 2 doors, square mullions, clear glass. Purchase cabinet and replace existing doors with the Mullion Doors. Gramercy White full overlay door, Birch, White finish, raised center panel, Matching finished interior and exterior. 6 way concealed soft close hinge. Mullion Glass Door fits 36"W x 42"H Wall Cabinet, 2 doors, square mullions, clear glass. Purchase cabinet and replace existing doors with the Mullion Doors. Gramercy White full overlay door, Birch, White finish, raised center panel, Matching finished interior and exterior. 6 way concealed soft close hinge. Gramercy White Mullion Glass Door fits 24"W x 30"H Wall Diagonal Corner Cabinet, 1 door, square mullions, clear glass. Purchase cabinet and replace existing doors with the Mullion Doors. Gramercy White full overlay door, Birch, White finish, raised center panel, Matching finished interior and exterior. Mullion Glass Door fits 24"W x 36"H Wall Diagonal Corner Cabinet, 1 door. Purchase cabinet and replace existing doors with the Mullion Doors. Gramercy White full overlay door, Birch, White finish, raised center panel, Matching finished interior and exterior. 6 way concealed soft close hinge. Mullion Glass Door fits 24"W x 42"H Wall Diagonal Corner Cabinet, 1 door, square mullions, clear glass. Purchase cabinet and replace existing doors with the Mullion Doors. Gramercy White full overlay door, Birch, White finish, raised center panel, Matching finished interior and exterior. 6 way concealed soft close hinge.